Once upon a time, due to the difficulty of aluminum smelting, aluminum is a display used by nobles to show off and showcase the countryâ€™s industrial strength. At the 1855 Paris Expo, a small amount of aluminum metal samples were displayed beside the crown jewels of the priceless city of France. For the first time, the public was made aware of the new metal, aluminum. The top of the Washington Monument, completed in 1888, was made of 9-ounces of solid-state aluminum manufactured by Mullin Plains, which was originally made of 00 ounces. At the time when architects chose materials, they chose not to weather or rust. The aluminum comes as a material. The pyramid was a large block of aluminum at the time and was placed in the Tiffany jewelry store in New York City before being placed at the top of the monument. At that time, the method of manufacturing aluminum was very complicated and prone to explosion. Therefore, there were few people who smelt aluminum, and the output was low. Therefore, aluminum became a treasure in metal. Aluminum is one of the 92 metallic elements of the earth. The earth's crust contains about 8% of aluminum, which is second only to oxygen (47%) and silicon (27%). Although aluminum has more reserves than iron, the history of aluminum smelting has been less than 200 years. This is because the chemical properties of aluminum are more active than iron and it is difficult to extract it from ore. It was not until the end of the 18th century when people discovered the method of electrolytic aluminum. The basis for the mass production of aluminum today. Aluminum is called the second metal by the world, and its output and consumption are second only to steel. Aluminum has special chemical and physical properties. It is one of the more commonly used industrial metals. The more important characteristic of aluminum is light weight. The density of aluminum is only 2.7g/cm3, which is about one third of the density of steel or copper, and Has good ductility, conductivity, thermal conductivity, heat resistance and nuclear radiation resistance, is an important material for economic development. Pure aluminum is soft and has little strength, but by adding other metals to aluminum, it can become a variety of aluminum alloys, greatly improving the performance of aluminum. If a small amount of copper is added to aluminum, a tough and corrosion-resistant aluminum-copper alloy can be obtained, which has a hardness close to that of steel and has a metallic luster that does not easily become dark, and is often used in the manufacture of jewellery Accessories and the construction industry. When magnesium is added to aluminum, an aluminum-magnesium alloy is produced, which is much harder than pure magnesium and pure aluminum, and retains its light weight characteristics, so it is commonly used in the manufacture of aircraft fuselage and ships. Aluminum has good ductility, can be drawn into filaments and pressed into aluminum foil, so it is widely used in the manufacture of Wire , cable, radio industry, and packaging. Aluminum has about two-thirds of the electrical conductivity of copper, but because its density is only one-third that of copper, compared to aluminum wires and copper wires of the same quality and length, aluminum's electrical conductivity is about twice that of copper. Therefore, high voltage cables are mostly made of aluminum. In addition, the lightness of aluminum also saves the cost of building a large number of support cables. The thermal conductivity of aluminum is three times greater than that of iron. Aluminum is used in industry to manufacture various heat exchangers, heat-dissipating materials, etc. Many of the cooking utensils are also made of aluminum. Compared with iron, aluminum does not rust and prolong its service life. Another valuable feature is recycling. Recycled aluminum comes from all types of waste aluminum such as beverage cans and waste cars. The production process consumes only 5% of the energy of raw aluminum, the production cost is low, and the original aluminum metal is retained. Characteristics, to meet the current trend of environmental protection and energy conservation. 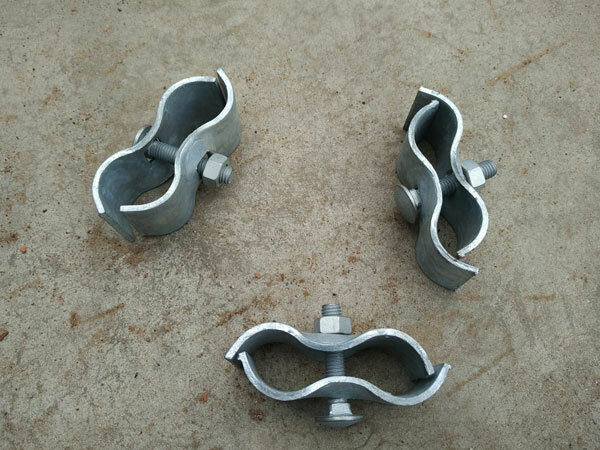 The Temporary Fence Clamp is the connection of Temporary Fence panel. and it can match the 32mm pipe,42mmm pipe.